Enjoy a fireworks show on Independence Day! Photo credit: Pexels. By Lesley Van Winkle, News of Mill Creek. 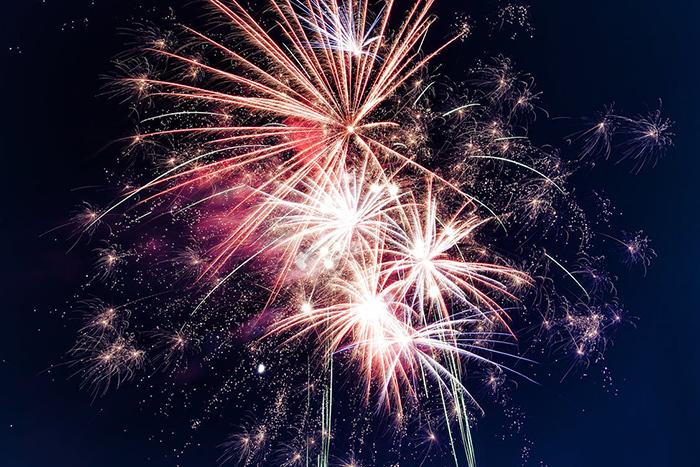 Even though the City of Mill Creek does not have a celebration planned for July 4th and prohibits fireworks, there are plenty of other local Puget Sound cities with fireworks shows to cap off your Independence Day. In addition to firework shows there are many family activities; parades, games, music and other entertainment at these events. Check out the websites for more information. Time: 10:05 pm. - Fireworks show synchronized to the Bellevue Youth Symphony Orchestra. Event: An Edmonds Kind of 4th. Place: Civic Stadium, 6th and Bell. Time: 10:00 pm. - Fireworks display set to traditional music. Event: Colors of Freedom Celebration. Time: 10:00 pm. - Thunder on the Bay Fireworks. Port Gardner Bay. Viewing Areas: Legion Memorial Park – 145 Alverson Blvd., Grand Avenue Park – 1800 Grand Ave., Everett Marina District. Event: 4th of July Fireworks. Place: Lake Washington, Log Boom Park, NE 175th Street & 61st Avenue NE, Kenmore. Event: Celebrate Kirkland! 4th of July. Time: 10:15 pm. – Fireworks show. Event: Seattle Cancer Care Alliance Seafair Summer 4th. Time: The fun starts at noon and the fireworks will begin around 10:00 pm.